A quaint front porch welcomes you to this spacious and carefully designed two story home with 5 bedrooms and 5 baths. You will discover an unusual abundance of features in an affordable 2698 square feet. Step inside to a spacious foyer which provides direct access to an elegant dining area and a comfortable guest suite. 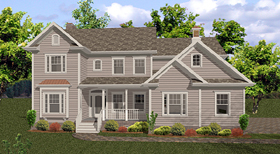 Beyond, you will find a grand two story family room which is open to the kitchen and breakfast area. We have also provided an enormous 4 car garage for today’s “mobile” families…allowing plenty of room for the family’s recreational “toys”. Upstairs you will find 3 bedrooms, each with a private bath and abundant closet space, plus a grand master suite. The master features a vaulted ceiling and a his and hers walk-in closet with an expansion area available to virtually triple its size. The his and hers baths feature a vaulted ceiling with a radiused window above to provide plenty of light. Lower level ceiling heights are 9’, except for the family room which is 18’. The upper level ceilings are 8’ high except for the vaulted master areas.